Massachusetts is known as one of the most historic destinations in the nation. One of its biggest claims to fame being the location of the Revolutionary War, fought from Virginia to upstate NY to Pennsylvania to New Hampshire. The 13 original colonies took part in the battles , this year being the 243rd anniversary of the Battles of Lexington and Concord. Many define this war as what determined the spirit of the American people by not backing down and seeking independence. 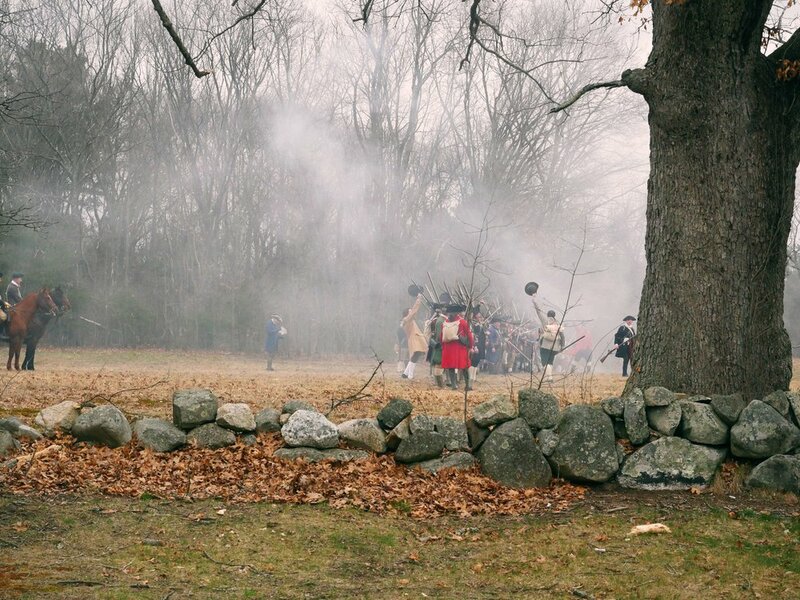 Because of this, people come from all over the world to see the modern day reenactments of the battles take place on the same soil as the original patriots. Wearing period clothing, muskets in hand and a wealth of knowledge, Hannes Klein and hundreds of other participates work to keep history relevant by reenacting these events. Klein’s participation is slightly unconventional from his counterparts. Being born in Germany and raised in Switzerland, he found his love of the reenactments through his 14-year-old son, Gavin, who’s a real “history buff.” Starting three years ago, the father-son duo have been staples for the Lincoln Minuteman Companies reenactments, Klein even garnering the honor of Sergeant Major, a voted position which is second in command. Klein, who is an energy conservation engineer, sees these reenactments as ways of re-living historical events, such as these battles, which to him are extremely valuable learning lessons to everyone, no matter the age or where they are from saying, “We learn from history, and if we don’t we get nowhere. It’s that simple. And it just seems to keep happening that certain historical events just keep regurgitating itself.” Klein believes many of the movements that are in public view today are repeating itself going on to say, “We didn’t get the message a thousand years ago, we still don’t get the message. How about we change the message.” Through these reenactments Klein hopes to help spur on the change he wants to see in people by reliving the past to make a better future. 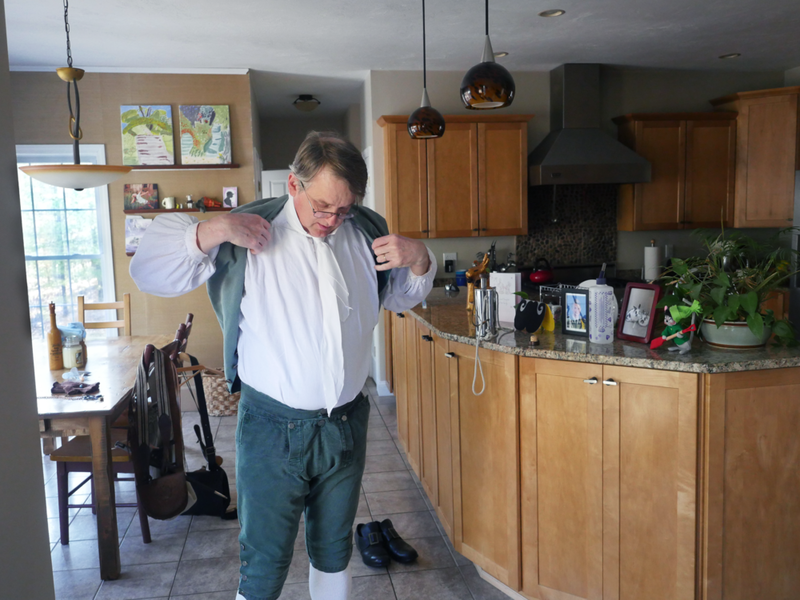 Bolton, MA - April 14th, 2018 - Hannes Klein puts on his colonial vest while preparing to participate in the reenactment of the 243rd anniversary of the Battles of Lexington and Concord. “The reason I’m doing it because I think it’s important that we keep that part of our history alive. Kids now don’t really realize what happened back then,” said Klein. This is Klein’s third time taking part in the reenactments. Lincoln, MA - April 14th, 2018 - Hannes and Gavin Klein check in for the Battles of Lexington and Concord. Hannes Klein says that the Battle of Lexington is iconic in the reenactment scene saying, “this is like almost one of the battles you have to have. You have to have fought on the battle green in Lexington.” This year the reenactments fell on the same day as a marathon being run in the Minuteman National Park. Lincoln, MA - April 14th, 2018 - On a brisk spring morning Hannes Klein makes his way to the preparations area for the Battles of Lexington and Concord. Klein has been apart of the Lincoln Minuteman Company for three years, this year being voted to be the Sergeant Major, second in command. 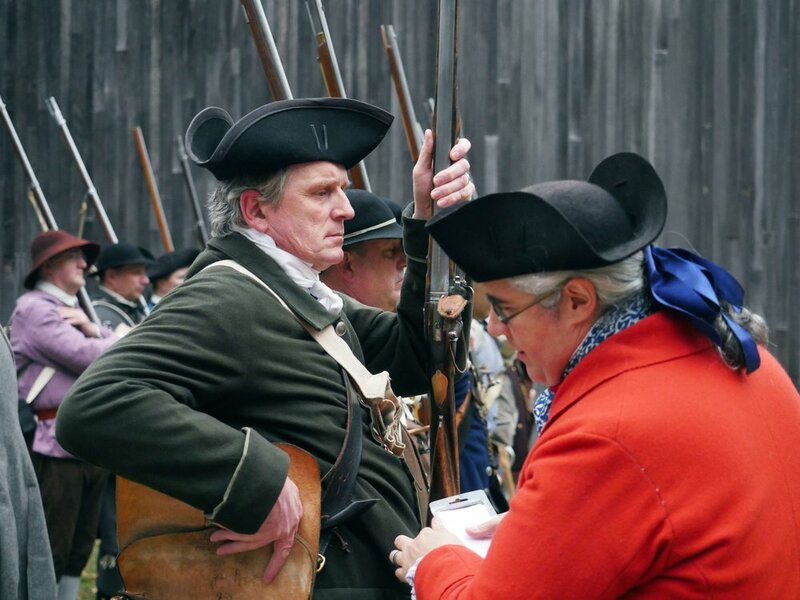 Lincoln, MA - April 14th, 2018 - Sergeant Major of the Lincoln Minuteman Company Hannes Klein hands out orders to reenactors participating in the Battle of Lexington and Concord battles. All men between 16 and 60 in the colonies were expected to be apart of the militia during the Revolutionary War. Lincoln, MA - April 14th, 2018 - Two young boy scouts look on as Hannes Klein rallies the troops for the 243rd anniversary of the Battles of Lexington and Concord. Klein says that the battle still garners a large crowd even in the inclement of weather. Lincoln, MA - April 14th, 2018 - Hannes Klein leads his men from the fourth battalion of the Lincoln Minuteman Company away from enemy fire during the Battles of Lexington and Concord. The reenactors do not use bullets in their guns, instead relying on powder to convey the shots. Lincoln, MA - April 14th, 2018 - Members of the militia celebrate after defeating the “regulars” in the Battles of Lexington and Concord. “To me it’s kind of interesting [because] they come out there to see us shoot our muskets, and that’s pretty much the extent and they don’t know anything that’s past that, and that’s our job to do that,” said Hannes Klein.